If you’re looking for a good book to read, you’ve come to the right place. This post is part of my monthly “What I Read” series, featuring the books I read the previous month with lots of recommendations for you! All of these book pair perfectly with donuts, cookies, pasta, or pizza… And always a glass of wine. How often do you have a DNF book? In case you’re not fully schooled in book lingo, I should tell you that “DNF” means “did not finish.” I have to admit that I’m really, really bad at DNF-ing books and will generally see a book through until the end even if I don’t really like it. I might read it a bit quicker and end up kind of skimming parts of it, but I will still get to that last page. I’m actually kind of jealous of people who can decide midway through a book that it’s not for them and just shut it for good. Apparently, according to research, this means I’m “gritty,” but I kind of just think it means I’m stubborn and a little ridiculous. There are so many books I want to read and not enough time to read all of them, so if I’m not happy reading something, I need to learn to just set it aside! I actually read one book last month that I really did not enjoy. But I kept reading it, in part because I was reviewing it for Netgalley and in part because once I start something I have a really hard time not finishing. Because then it feels like wasted time. But guess what? I wasted even more time by finishing it! All that to say, I’m not going to waste even more time reviewing it here. I’ve made the executive decision that if I really don’t like a book, I’m not going to review it here. Because a) what’s the point in telling you about books not to read? and b) I hate being negative and don’t want to harm an author (especially a new author) on a public forum. And honestly, it’s rare that I read a book that I really dislike to the point I can’t recommend it; generally, even if I don’t love a book, I can determine why people might think it’s great and who would love it. Tell me, how often do you read books you really don’t like? Do you persevere to the end or do you put it down and pick up something you know will make you happy? 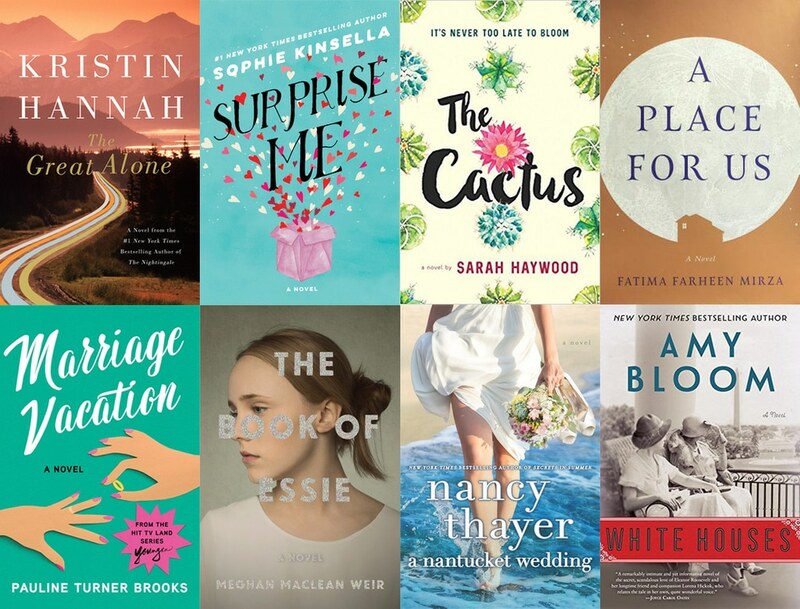 OK, let’s move on to happy positive things, like my book recommendations from June! (Just an FYI that links to some of the books and my BOTM link below are affiliate links. Thank you for supporting WANM!). Oh, and don’t forget to follow my book Instagram account (bookstagram!) at @booksontheside! If you’re ever looking for more great reads, Instagram is one of the BEST places to discover them! The Great Alone by Kristin Hanna: Oh yay! We’re kicking things off with a book that I have zero qualms about including here. In fact, this is one of my top books of 2018 so far. It’s by the author of The Nightingale (which I also highly recommend you read) and was my Book of the Month Club pick a few months back. Leni is 14 when her father decides to move her family to Alaska. At first, Leni and her mom think of it as an adventure and are hopeful the new setting will help cure Ernt of his PTSD and will ultimately make him nicer and less abusive. But the family doesn’t realize how tough life in remote Alaska is and how long, dark, and lonely the winters are. Leni’s saving grace is the small school she goes to with the one boy who is her age, Matthew. Matthew’s family is wealthy (at least by remote Alaska standards) and Leni’s father greatly dislikes them, which as you can imagine, causes all sorts of problems. This book gave me all the feelings and is the kind of book I kept thinking about long after I was done reading it (just writing this is making me want to read it again). I’ve heard some readers think the last part of the book is too dramatic and while I definitely understand that sentiment, I just feel like everything worked. I highly recommend this book, though I actually think I would have enjoyed it even more snuggled on my couch in the middle of winter instead of sitting outside in the hot sun. Surprise Me by Sophie Kinsella: OK, this is a cute book, but I loved Sophie Kinsella’s last book, My Not So Perfect Life, so much that this one felt just a little disappointing. But when I think about how far Kinsella has come since her Shopaholic days, I can’t help but love her so much. In this book, Sylvie and her husband Dan go to a doctor’s appointment where they learn they are both super healthy and are likely to live for another 68 years or so. Great news, right? Well, it actually causes the couple to panic a little. 68 years is a long time; how will they stay married and happy for that long? So, they decide to start doing little things to surprise each other and keep their marriage fresh. Kind of a cute concept, but also who the heck would panic in learning they will live a long time? I mean, consider the alternative! But it’s OK, I could put a little silliness aside to still enjoy the book. I really liked Sylvie and found her endearing, though her ditziness annoyed me in some instances. Her and Dan’s surprise game is pretty much a comedy of errors and in the meantime, there’s something else a bit heavier going on with their marriage. All that said, this is a fun book and I’ll certainly keep reading everything Kinsella puts out. Marriage Vacation by Pauline Turner Brooks: OK, onto something a bit lighter! But seriously, if you watch the show Younger, you’ve heard of this book before (and if you don’t watch the show Younger, you should! It’s so, so good). In the show, one of the character’s wives abandons her family for a year, taking what she calls a marriage vacation. When she returns, she writes a book about her experience, which ends up getting published (the show takes place at a book publishing house). They ended up actually publishing the book in real life and making it seem like it’s straight from the show, i.e. Pauline is the character’s name and all of the details in the book are taken from the show. While being a Younger fan will likely make you enjoy this book more, it’s not essential and you’ll still enjoy the book without knowing the story behind it. I’m actually not a fan of Pauline in the show (Team Charles! ), so I appreciated this deeper look into why she made the decision to leave her family and what she was doing while she was away. However, I have to say that I’m not sure if her story made me like her more or dislike her more! In any event, I just love that they made this into a real book and have a feeling it will be a trend we’ll see more and more (they did the same thing for Jane’s book from Jane the Virgin). White Houses by Amy Bloom: I love a good historical fiction book, so I was excited to pick up this one about the secret romantic life of Eleanor Roosevelt. I should start by saying I’ve never heard anything about Eleanor Roosevelt’s sexuality and had no idea that many people believe she was in a relationship with Lorena Hicks, who lived at the White House for several years. This book is all about that relationship. In some ways, it bothered me that these two ladies were having their personal lives fictionalized in such a way; it’s not like the author spoke to either of them and the book goes into some pretty detailed accounts of their relationship. But after doing research and reading some of Elenor and Hicks’ letters to each other (my favorite kind of historical fiction is the kind that has me doing my own research, too! ), I could see how much of this book was actually taken from real-life accounts and I think it was probably as factual as it could be. The way the book is written wasn’t my absolute favorite; it tends to drone on in a monotone sort of way… But it also has a sort of nostalgic voice, which makes sense for the content. Some of the people in the book got a little bit confusing and I would have loved some more historical details, as well as more detail on Hicks’ past since her childhood was a very interesting one. I did really enjoy hearing about FDR’s presidency, how he acted, what the public thought of him, etc. and overall, thought this book was an engrossing one. Clearly I had an awesome June of reading and I’m happy to report that trend is continuing right into July! Summer reading is some of my favorite and I’ve been trying to give myself some extra downtime on weekends to focus on reading (usually first thing in the morning with my coffee!). What books have your read that you’ve been loving this summer? 2 Responses to "What I Read: June 2018 | Recommendations for Books to Read"
And now I have a bunch more books I need to add to my list. Thank you! Oh and I am good at DNF-ing books. I hate wasting time! I only keep reading ones I don’t love when it is for bookclub. I rationalize that being a Lit major in college meant reading everything w/o the choice. Sometimes I keep it on my to-read list if I think at another time I’d be into it. I added a GoodReads category for ones I quit and prob won’t revisit.